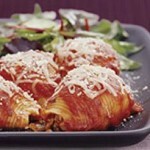 Stuffed Pasta Shells is a slow cooker recipe with mozzarella cheese. Cook pasta shells according to directions, just until tender and drain. Meanwhile, brown beef, onion and garlic on stove top and then drain. Add Mozzarella, bread crumbs, parsley and egg. Stuff shells, set aside. Pour 1 jar of sauce into crock pot. 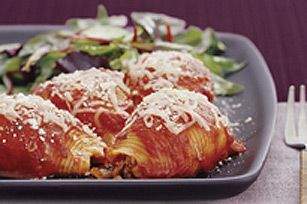 Arrange stuffed shells in sauce. Top with other jar of sauce and Parmesan cheese. Cover and cook on low 5 to 7 hours.